Worksheets are an effective tool in our ongoing efforts for encouraging students to engage their brains during class. Worksheets used in class can also help direct students' learning out-of-class. The following list, gives examples of goals that can be addressed by using worksheets. 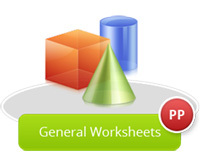 General Worksheets are sub-topic level, subject specific and curriculum specific. They are predominantly in formats like – multiple choice, true/false, /fill-in-the-blanks, etc. and are automatically graded and can be printed. At the end of each worksheet a summary and detailed reports are provided. These worksheets reinforce subject knowledge and act as individual assessments and study material. Each of these worksheets accrues loyalty points - PP Power Points rewards that can be redeemed for gifts. These worksheets are good practice for tests and induce confidence and class level learning material for students. 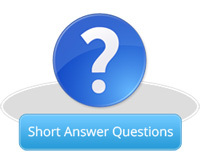 Short Answer Questions are sub-topic level, subject specific and curriculum specific. They are not gradable however, can be printed. Teachers can utilize this resource as a questions database to prepare tests. Short Answer worksheets help student with appropriate writing skills. Class 5 :: Science :: Plants :: How do plants reproduce? Which of the following can be identified with your eyes closed, just by smelling it? Which of these shows the bamboo Plants? When cement is mixed, it is a wet paste. It becomes hard only after it dries. Which of the following would be the best to put wet cement between bricks? - It is a soft solid. - It can be squeezed easily. - It changes shape when dropped on the ground. Why are buses more common than trains in hilly and mountainous areas? The device shown alongside is generally used in the case of an emergency. What sort of emergency is it used in? One of the zoos in India brought an animal that was NOT found in the forests of India. Which of these could it be? Shown here is an image of a sign board found at an airport, to guide people. According to this sign board, which two places are in the same direction? Based on who eats whom, organisms can be arranged in a particular order. For example, in the image below, a deer eats grass and a tiger eats deer. In which of the following are the organisms arranged correctly in this order? In which of the following pictures is water being used carefully, and not being wasted? Class10 :: Maths :: REAL NUMBERS::EUCLID'S DIVISION LEMMA? Answer: When we you dig a hole in the ground, we find moist soil at certain depth. Soon, on further digging we reach a depth at which all space between the soil particles and cracks in the rocks are filled with water. The upper limit of this depth is called the water. Answer: The water found below the water table is called groundwater or aquifer. Answer: At places the groundwater is stored between layers of hard rock below the water table. This is known as an aquifer. Water in the aquifers can be usually pumped out with the help of tube wells or hand pumps. Answer: The rainwater and water from other sources such as rivers and ponds seeps through the soil and fills the empty spaces and cracks deep below the ground. The process of seeping of water into the ground is called infiltration. By this process of infiltration, groundwater gets recharged. Can we keep on drawing water from under the ground? How will it affect the water table? Answer: Ground water is an important source of freshwater. Due to unnecessary drawing of water by tube wells and the water table not being replenished/recharged property may leas to depletion of water table. This would further lead to shortage of freshwater in that area. Name the process by which groundwater is recharged. People obtain groundwater through _____ and _______. Three forms of water are _____, _____ and ______. The water bearing of the earth is ______. The process of water seepage into the ground is called ______.